The Fairy Duster is a small shrub that grows to about 2 feet in height and is a member of the Pea Family. Leaves are dark green and feathered and appear similar to those of the acacia (though unlike the acacia, the Fairy Duster has no thorns). The plant grows throughout the Sonoran Desert on hillsides, washes and grasslands below 5000 feet in elevation. The plant begins to bloom in Arizona in February and produces a distinctive round pink flower. The flowers are pollinated by a variety of bees, flies and butterflies. During dry spells the leaves may wilt, but grow back again when it rains (draught deciduous). 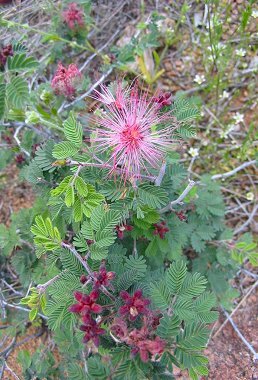 Because the Fairy Duster is draught resistant, an evergreen and bears an attractive flower, it is often used as an ornamental shrub for landscaping in Arizona.